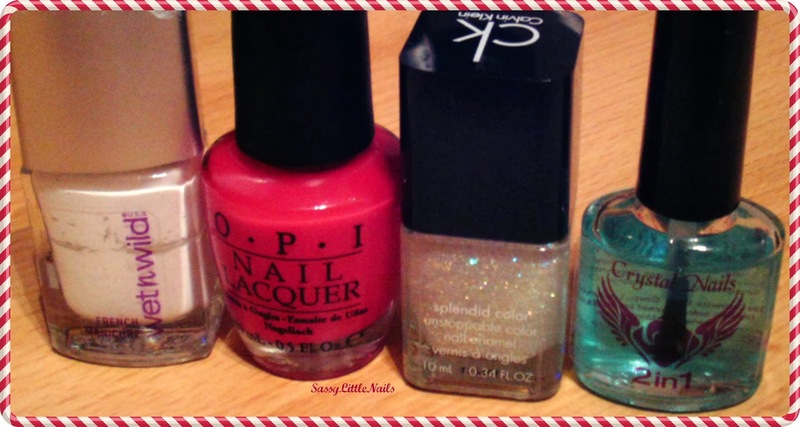 8 Days Christmas Nails Challenge & 12 Days of Xmas Manis challenge! 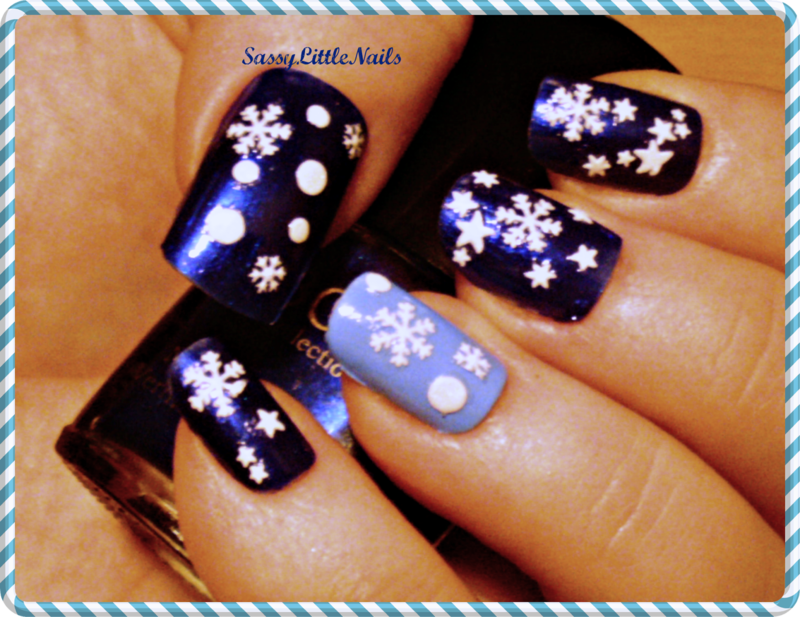 I am going to try and take part in 2 festive nail art challenges for the Christmas period! 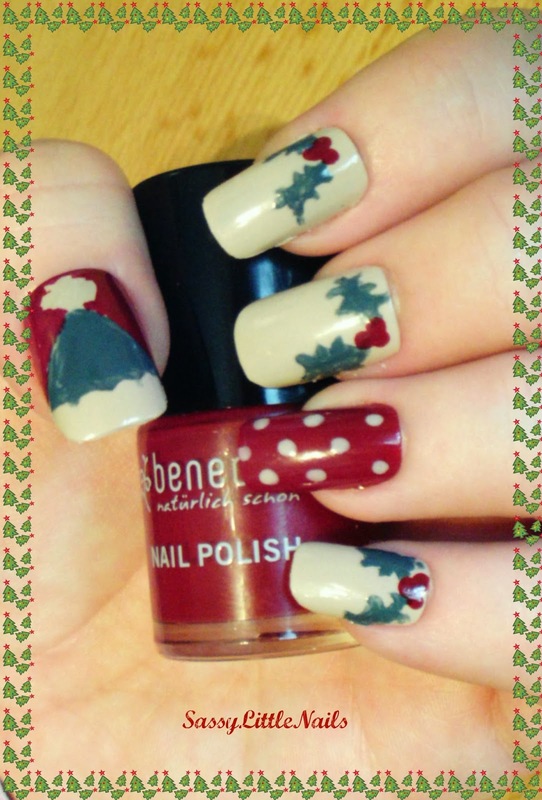 First Challenge is by the lovely Tracey at bitenomore 8 Days Christmas Nails Challenge! 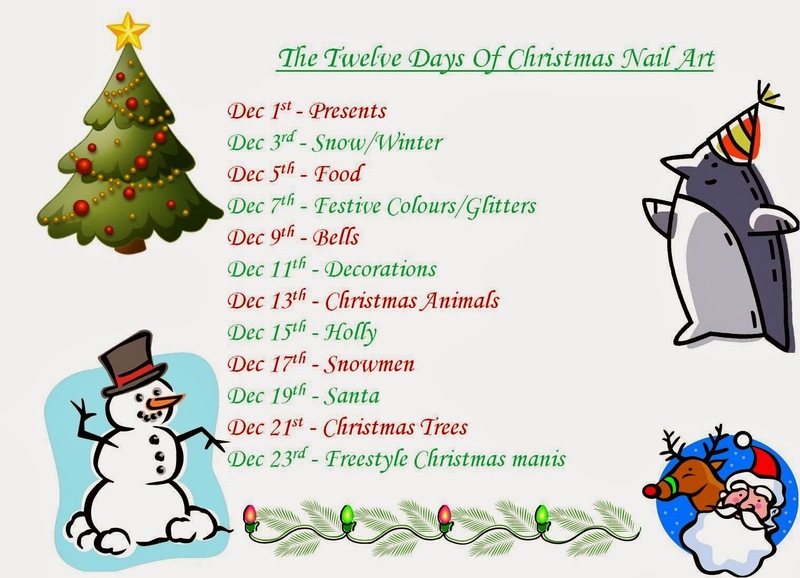 8 Days Christmas Nails Challenge Its open to anyone and everyone who wants to join in :) Even if you can only do some of the themes and days, you are all welcome to participate if you want to, the more the merrier!! 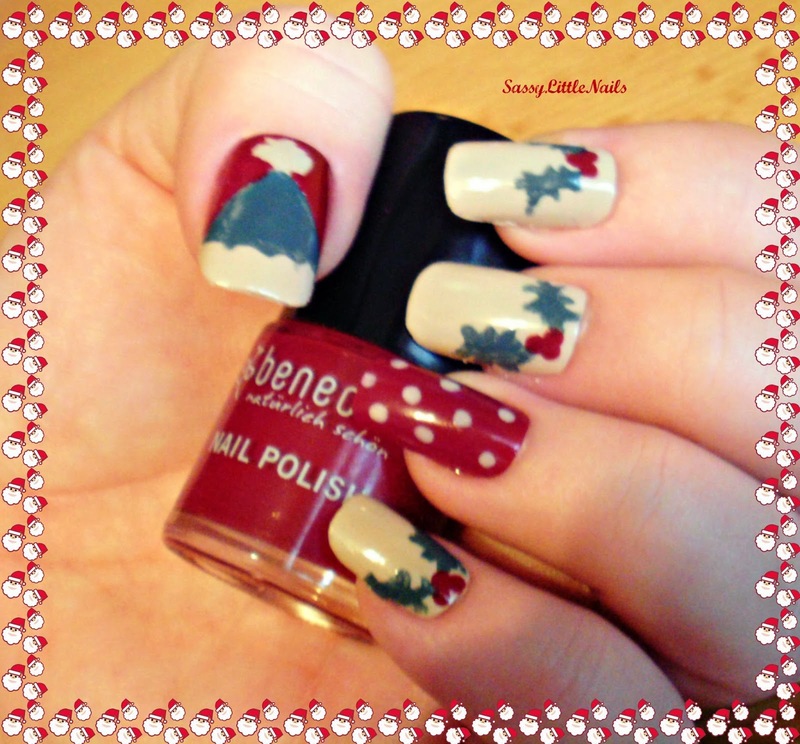 The next challenge is by the lovely Nail Art Novice 12 Days of Xmas Manis challenge! 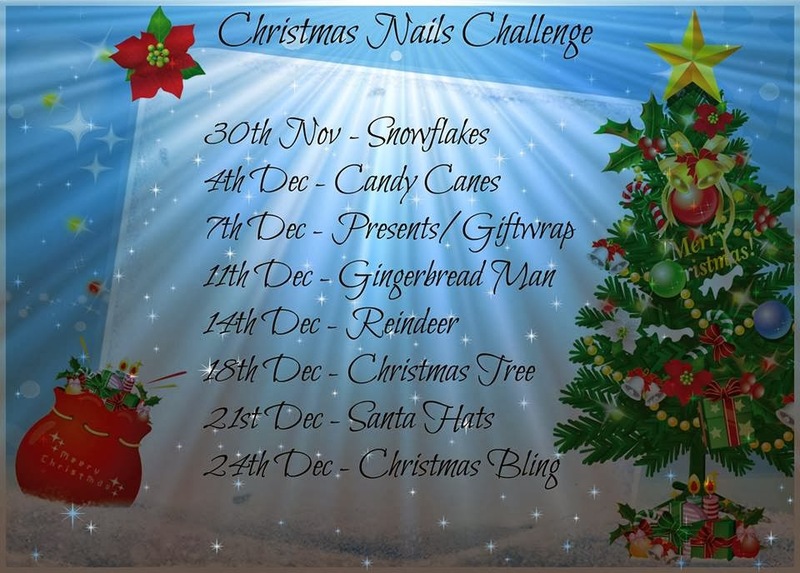 12 Days of Xmas Manis challenge there will be 12 challenge days starting on the 1st December and running every other day until the 23rd. You are free to drop in and out of the challenge as it goes on-do as many or as few of the prompts as you like-it's all just a bit of fun and nothing too serious. Let me know if you decide to take part in any of these challenges? 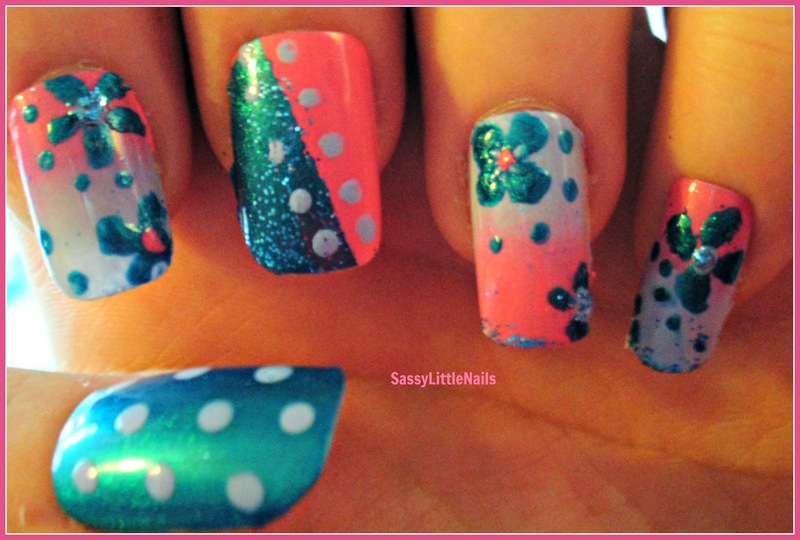 My challenge nail art is to follow shortly! What has happened to this year! it's gone by soooo fast! 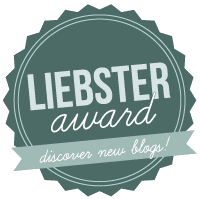 Anyway I have joined The #2014BloggerChallenge! 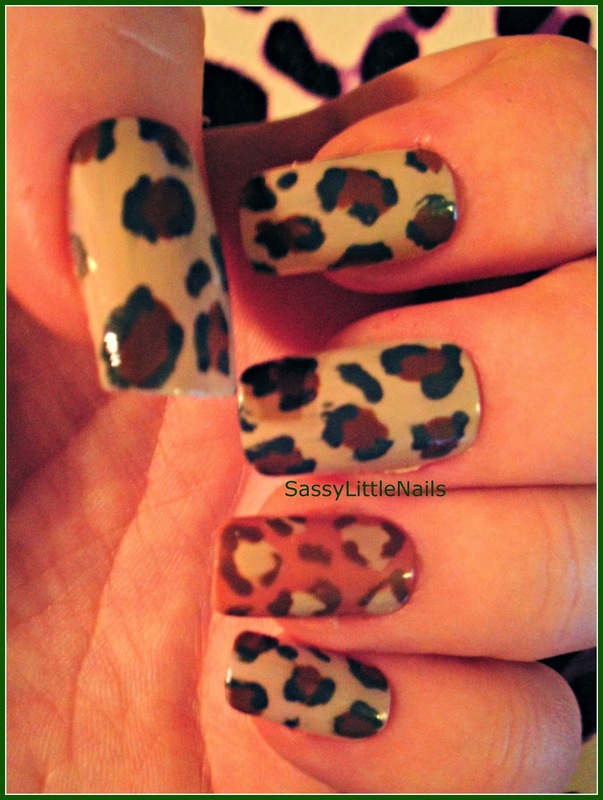 this was created by the fabulous Gaby AnotherGirlyBlog. This challenge is to write a blog post twice a month on different topics. The posts will go live during the 1st and 3rd week of each month. 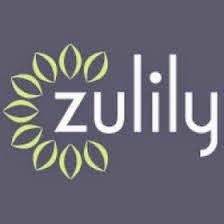 Everyone who decides to sign up will get the topics emailed to them by Gaby. These topics are to give you new ideas to encourage everyone to write about things they wouldn't normally write about. Any Blogger can get involved no matter which topic! 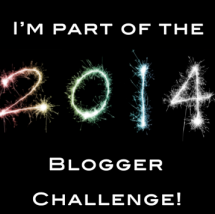 The #2014BloggerChallenge is also to help you gain more traffic, discover new blogs and even make blogger friends. If you'd like to be apart of this, all you have to do is email Gaby at anothergirlyblg@gmail.com with your name, your blog url and email address so Gaby can add you to the list of participants. - it's that simple! 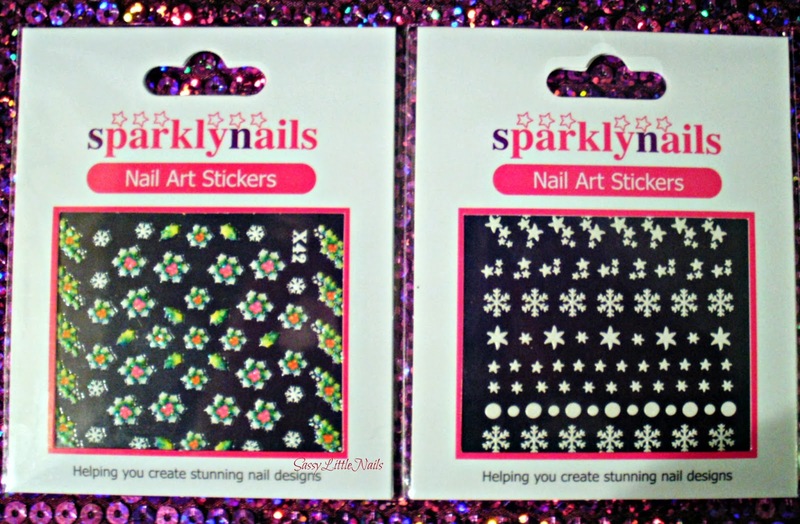 I was sent these 2 lovely Christmas Nail Art stickers for review from the fabulous Sparkly Nails web site. 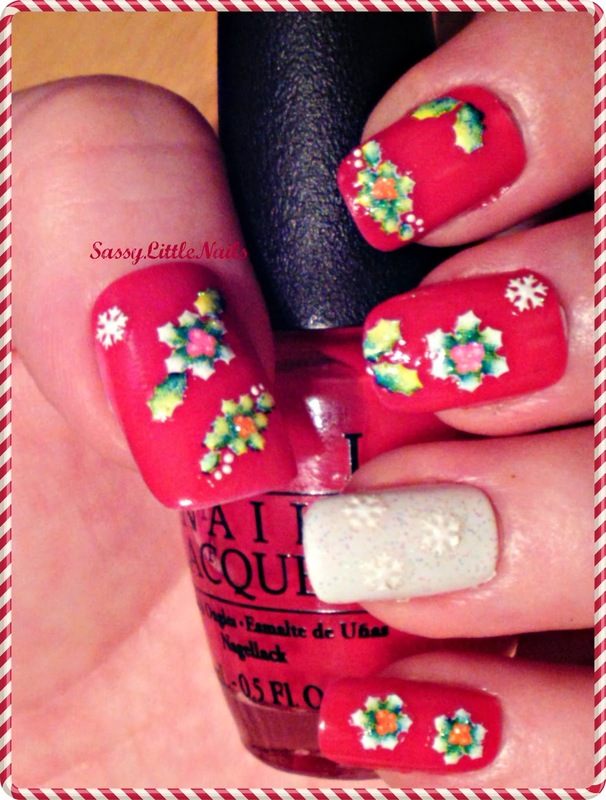 On the left : Holly Berry Colour Stickers. On the right : Snowflake White Stickers. 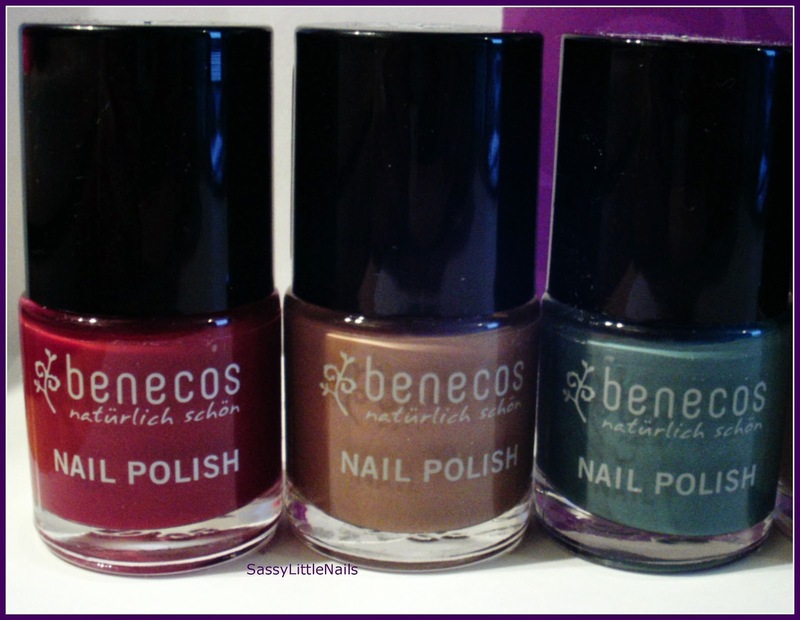 Polishes used for this review. Laval Crystal polish in Pastel Blue. 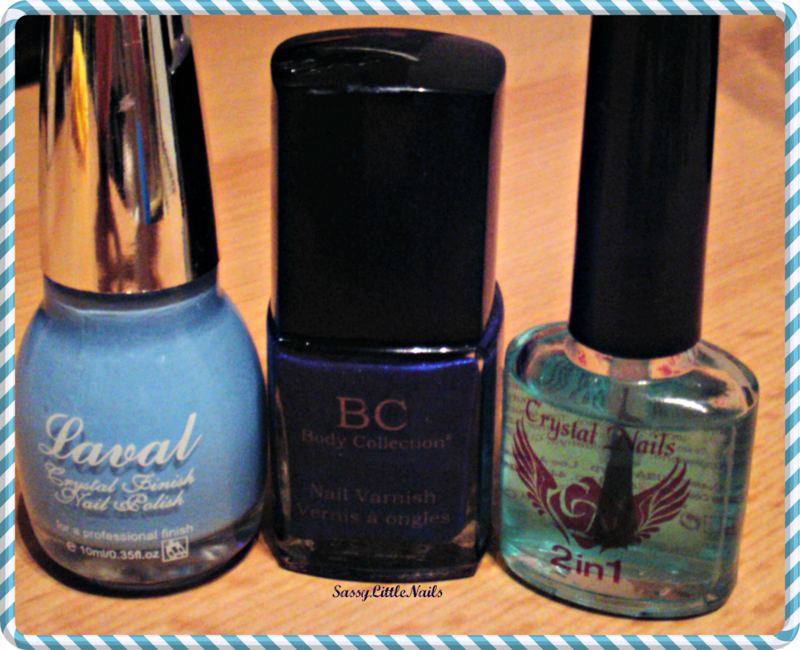 BC Nail varnish in Sapphire. 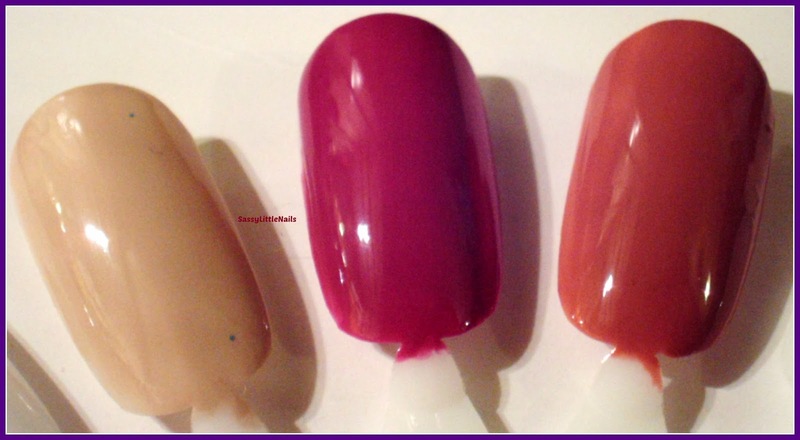 Crystal Nails 2in1 base&top coat. I used the Crystal nails base coat then applied the BC polish on the thumb and fingers except for the ring finger which I painted using the Laval polish. I then stuck the Sparkly Nails stickers randomly on each nail and then applied the Crystal nails as a top coat. Wet n Wild Manicure White Polish. O.P.I Nail Lacquer in Too hot pink to hold em. Calvin Klein Glitter polish in Hallucinate. I painted all the nails and thumb with the O.P.I polish except the ring finger which I painted using the Wet n Wild white polish. 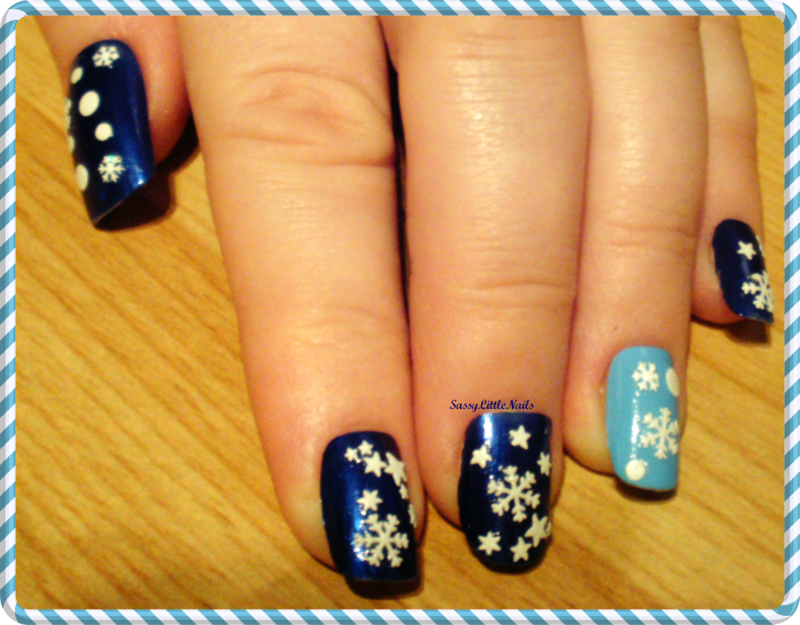 I used the Calvin Klein polish over the White to add a bit of sparkle.then I placed some snowflakes on the ring finger. 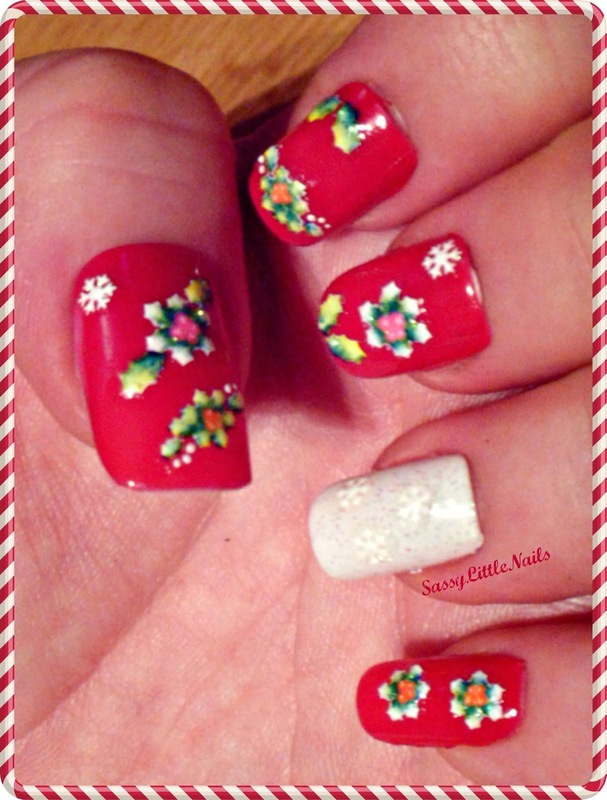 I love these Nail art Festive stickers from Sparkly Nails! 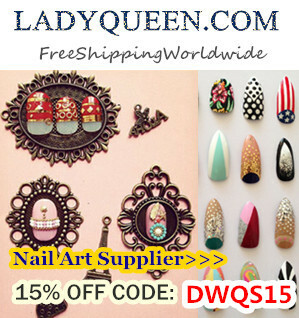 they are incredibly easy to use and apply.you can check Sparkly Nails web site by clicking HERE. A special thanks to Sparkly Nails for sending me these stickers to review! Hi Bloggers Hope your Sunday is relaxing and you all are well. I seen this tag I'm a Beauty Blogger, Get Me Out of Here! Created by Rochelle and Natasha from Next-Route-Style. I like watching the program have done since it first started! So thought I would join in and have ago at this fun tag,and if you’re reading this, you’re tagged! As part of the tag, please include in your post the photo, the list of questions and your answers. Here is mine! 1.You only have five minutes to get ready before going into the jungle, what would be your quick beauty routine? I would tie my hair back and put on insect repellent and tuck my jungle pants in my socks.put some lip balm on.and sunscreen high factor as prior to going in the jungle I would have already had my eye lashes tinted eyebrows shaped and waxed and my body waxed and hair free. 2. Last year we saw Helen Flanagan wearing her hair in a top bun. What would be your signature hairstyle? I would possibly have my hair in a tight skull plat or a high bun and a head scarf. 3. For moral support, which female celebrity would you like to be in the jungle with you? Thats a difficult one,urmm either Oprah Winfrey because she is such an inspirational amazing positive lady. or Angelina Jollie because she is an inspiration to women also and would be a great team spirit/leader. 4. Everyone’s given a role in the camp. What lifestyle skill would you bring to the jungle? Not a skill as such but I would bring humour lol keep everyone's spirits high as much as possible other than that I would be the cleaner tidying the camp as much as I could making sure there is no bugs of the bacteria kind lurking. 5. 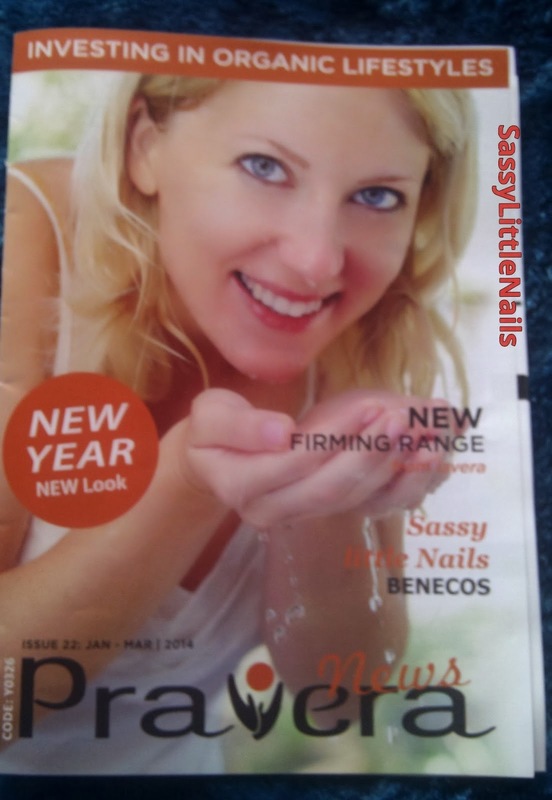 What one thing about being a beauty blogger sometimes makes you want to scream ‘Get Me Out Of Here’? It would have to be when I mess up a nail design or I cannot get the hang of something new and make mistakes and I wont quit till I've done it! 6. Challenge – This is a once in a life time opportunity. You’re up for a trial to face your fears or try something new, what would you choose to do and why? I think it would be something to do with heights as I am scared of heights so that would be a fear to face.as I wouldn't wanna face my spider fear no way! unless I had to jump out of a helicopter away from them! That's me done! now I tag these lovely bloggers to head to the jungle next! Are you watching this years 'I'm a Celebrity'? So I know you’ve taken part please leave your blog links as a comment below and I will read your blog and respond. I can’t wait to read all your answers. 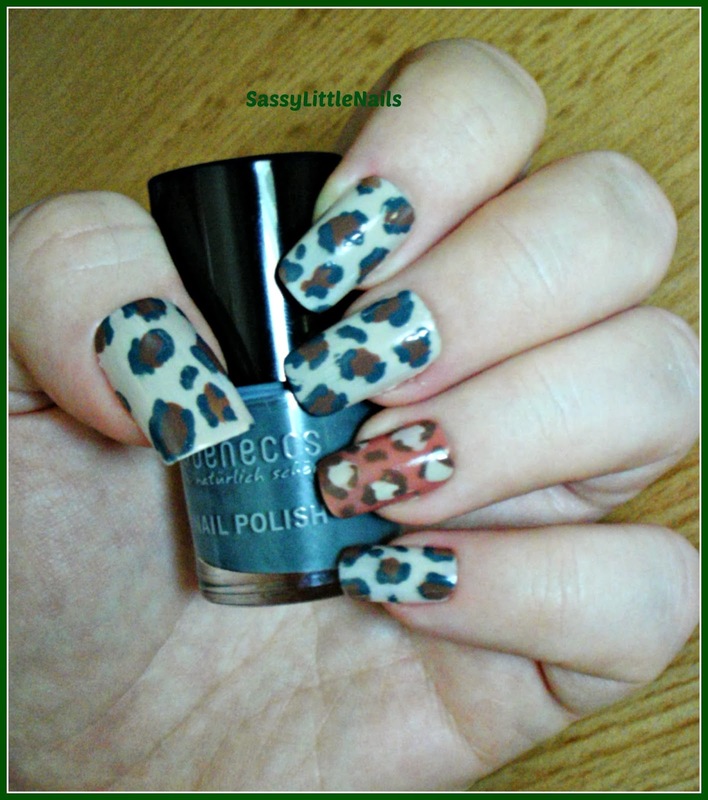 The Sparkle Queen: ShePicksMyPolish Novemeber Challenge! Hi Everyone hope you all well.We are at it again! 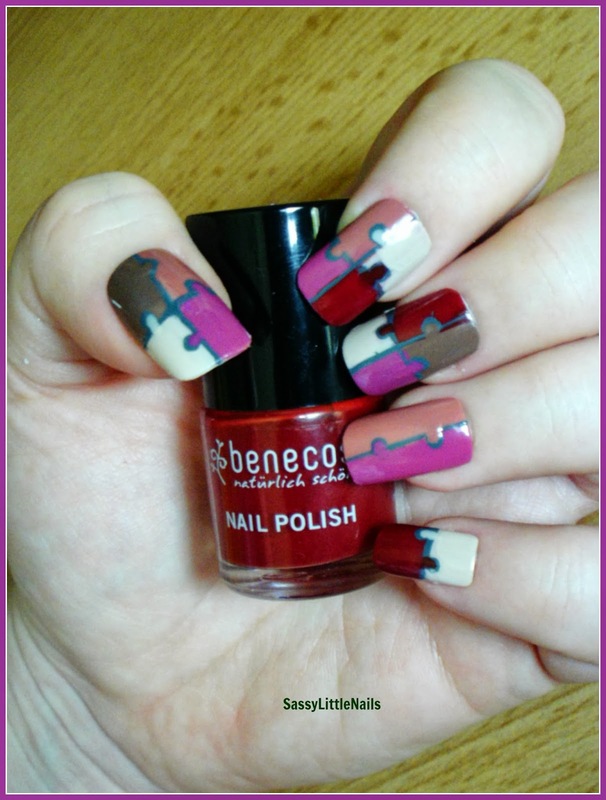 We had such a fun time with the October#HePicksMyPolish challenge that we thought we would do another round in November. 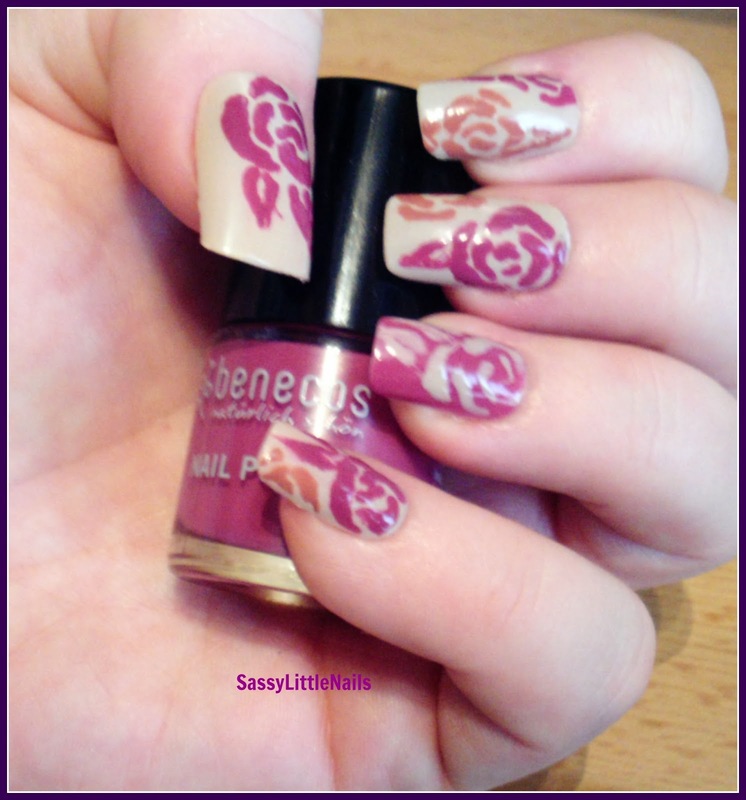 Same rules apply only this time it's ShePicksMyPolish this time! this can be any female Mother/Sister/Aunt/Neice/Daughter/Best Female Friend. 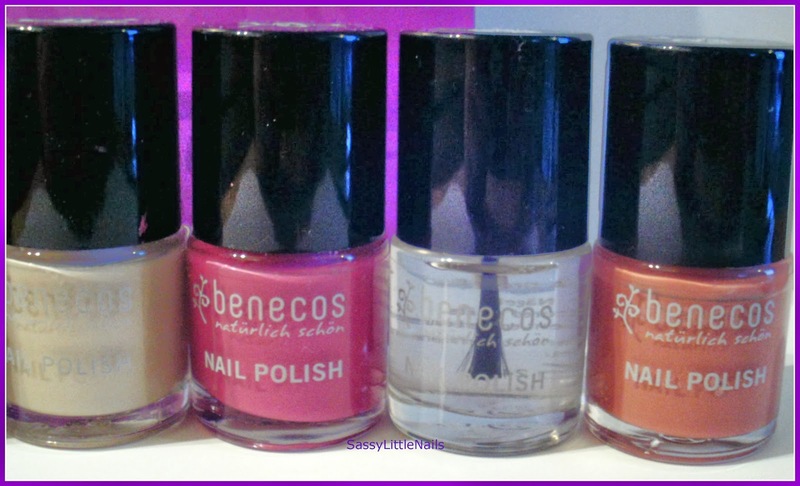 She can pick 1/3 Polishes of her choosing that's all no influences from you while she picks! 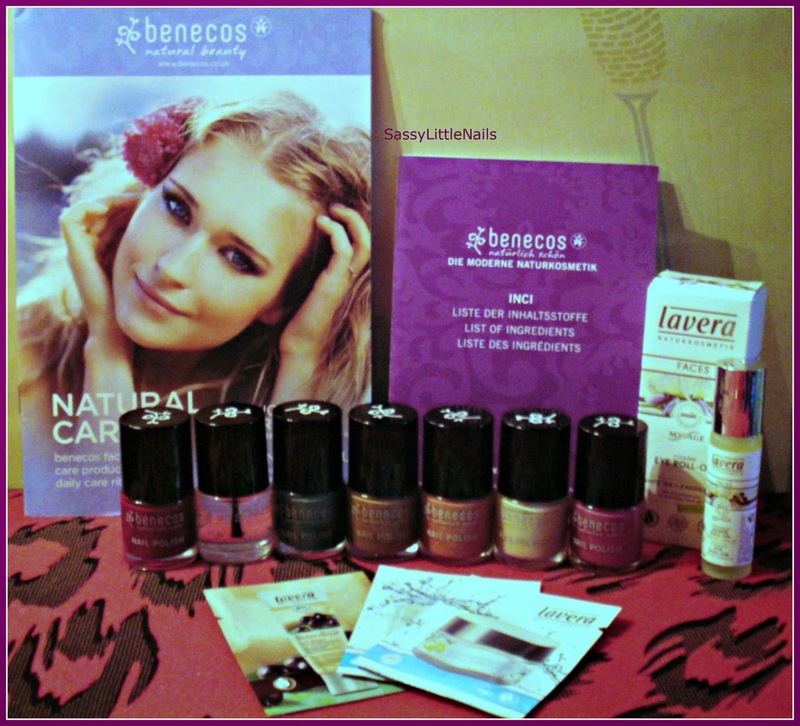 You can have a clear base or top coast or neutral polish that's it. 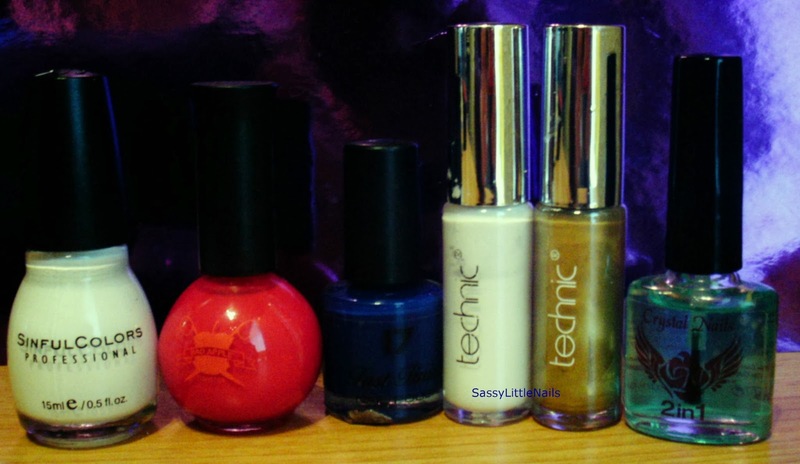 I asked my Lovely Daughter Kimberley to pick 3 polishes for me. 17 Last finish polish in Peacock. Constance Carroll Diamond Gloss polish in Pastel Pink. 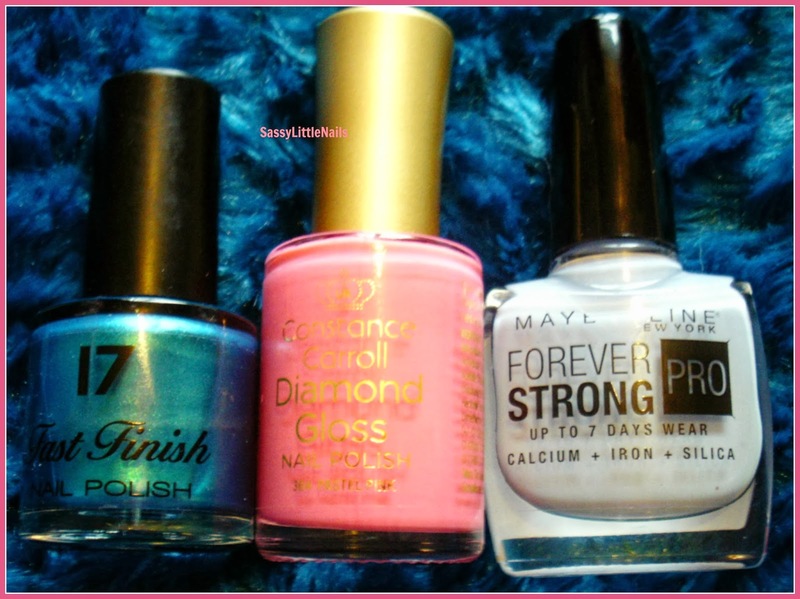 Maybelline Forever strong in Ceramic Blue. 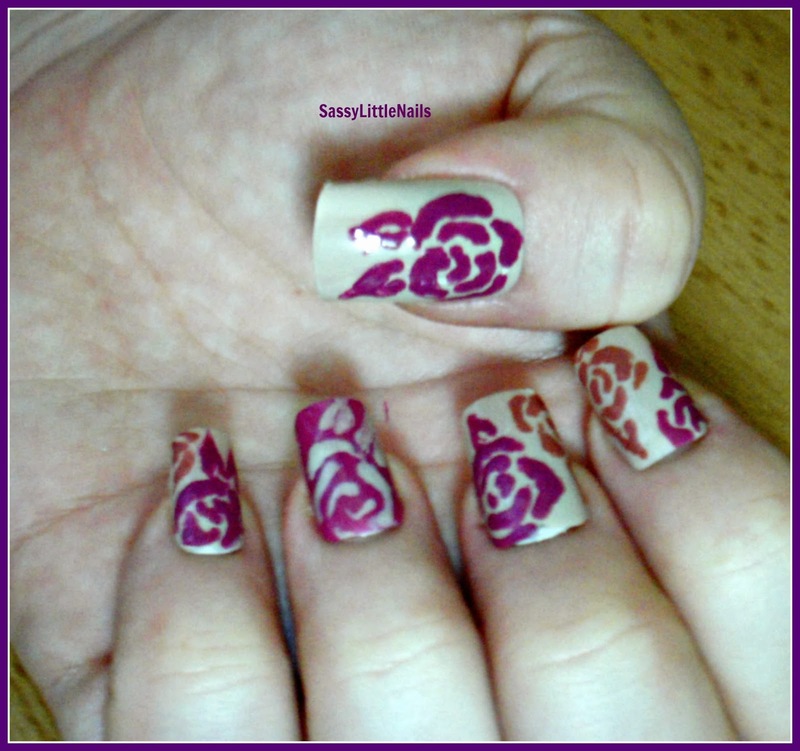 Kimberley chosen well I thought and I came up with this Nail art design. 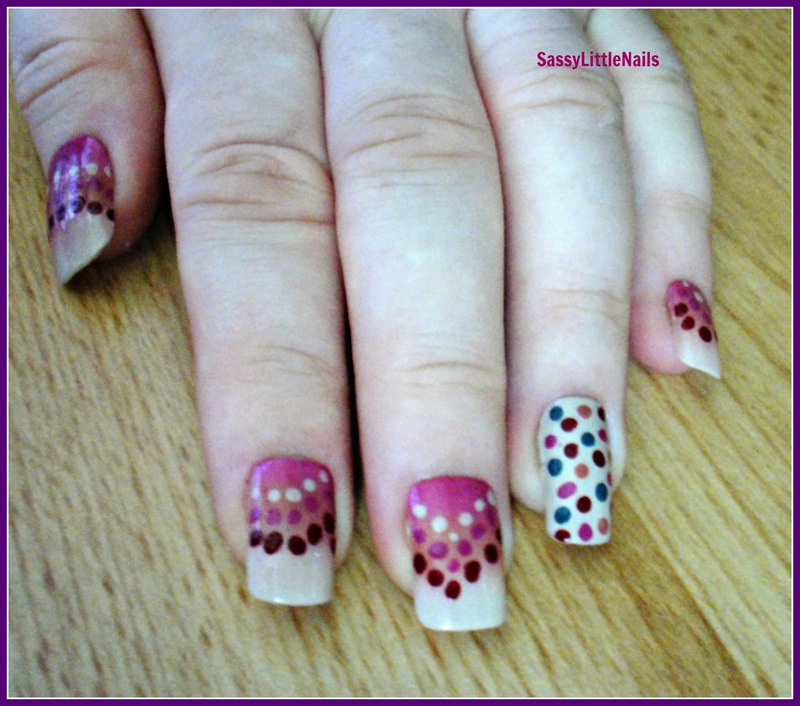 I started with a base coat using the Maybelline polish and I then took the 17 polish and did 2 coats on the thumb.using a dotting tool took the maybelline polish and did some dots. 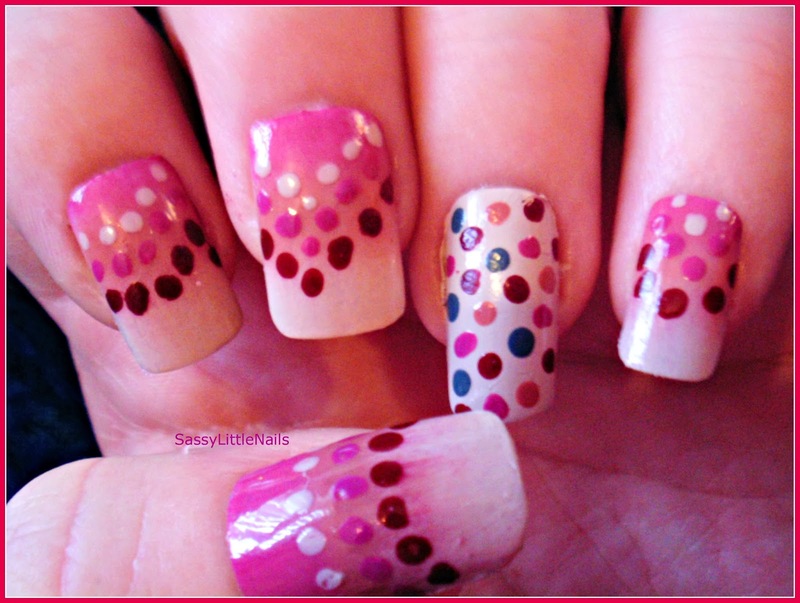 I took a make-up sponge and did the Ombre effect on the fingers except for the middle finger I took some tape and did half/half of the 17 polish and Pastel pink.I then used a dotting tool and did some dots with the maybelline polish. 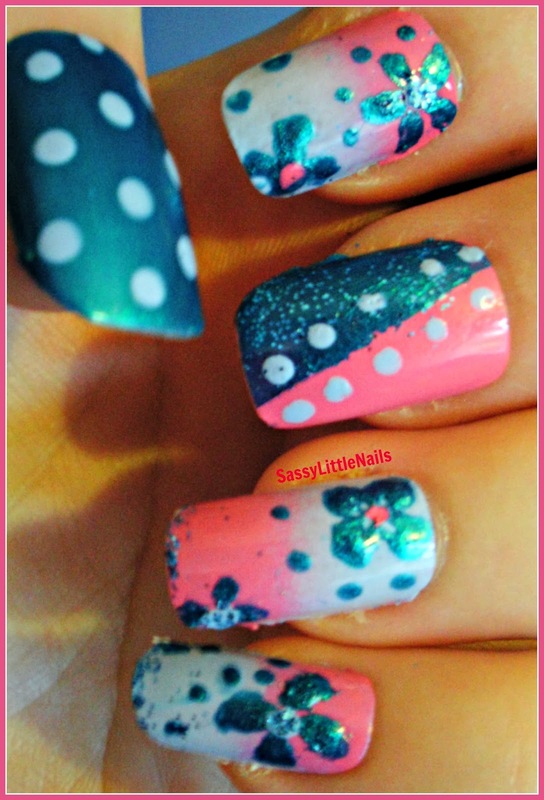 Using the dotting tool I made some flowers on the Ombre fingers and random dots. Applied a top coat and all done! 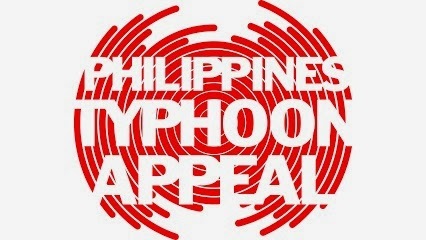 I am joining Rachel in the appeal to raise awareness and reach out to the kind hearts of the world to help The Philippines Typhoon Appeal. Typhoon Haiyan was 300 miles across when it struck the Philippines on the 8th of November 2013 and one of the most intense tropical storms to ever make landfall anywhere in the world. It brought torrential rain, sustained winds of over 195mph and a storm surge of up to 30 feet that devastated coastal areas. There are millions of people who have been affected, including hundreds of thousands who have been forced from their homes. There are countless dead. 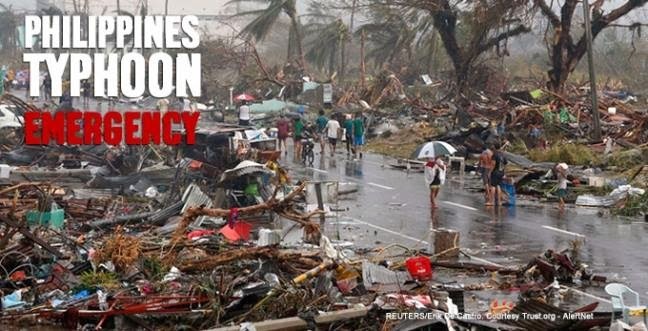 Those who have survived now need urgent help including emergency shelter, clean water and food. This is were I ask all my wonderful followers/readers to help raise the awareness and help donate to this desperate Appeal. The British Red Cross is a member of the Disasters Emergency Committee, which brings together 14 leading UK aid charities in times of crisis. you can also visit their site and donate click HERE. Please be assured that every dollar counts! Just one US dollar can buy 3 pounds of rice or 3 cans of sardines or 4 litres of drinking water.give what you can to help these people in dire need Thank you. 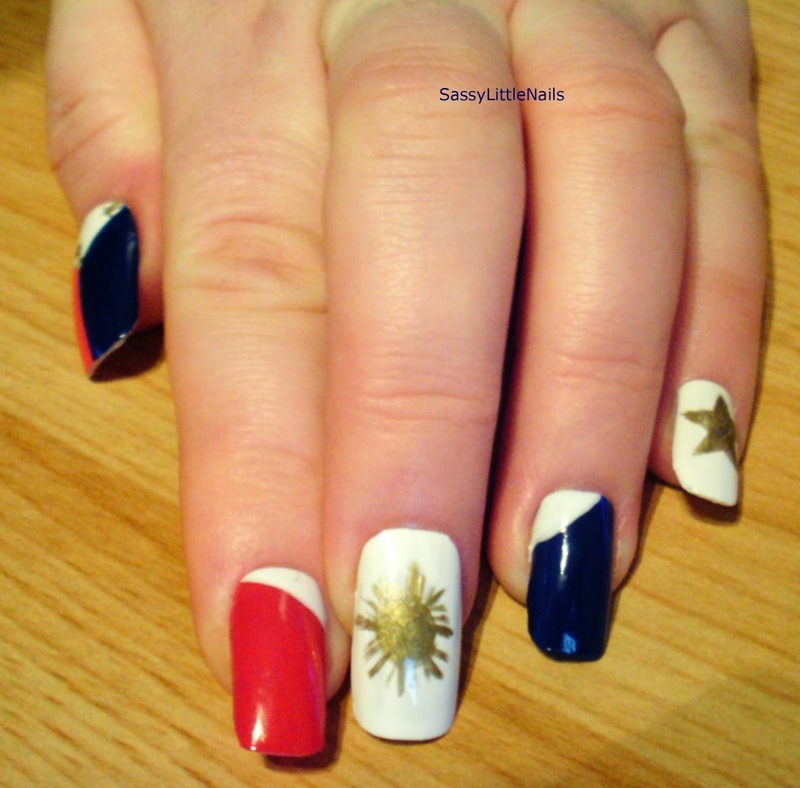 I wanted to do my version of the Philippines Flag to honor the strength of the Filipino people and to raise awareness of the situation there. 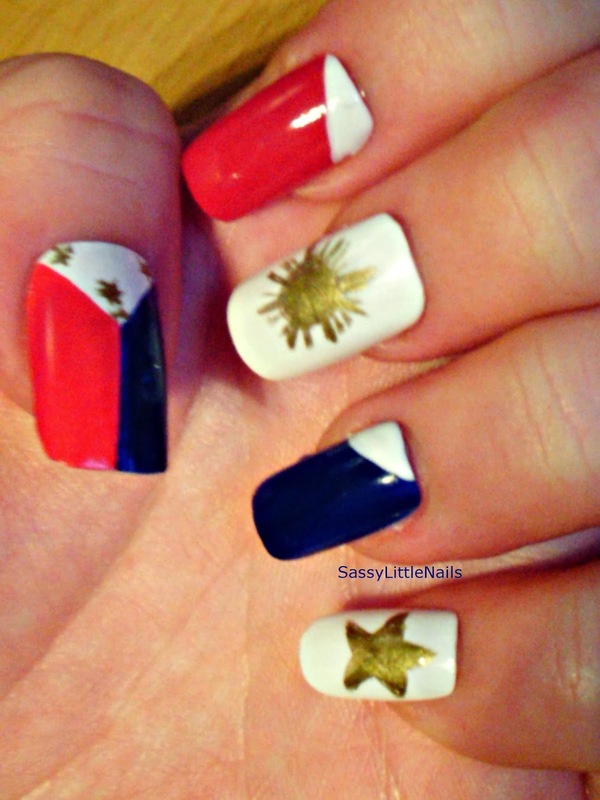 Here is my nail art version of the Philippines Flag. Bad Apple polish in Red Delicious. 17 Last Finish polish in Midnight Blue. Technic Nail art pens in White and Black. Crystal Nails 2in1 base and top coat. 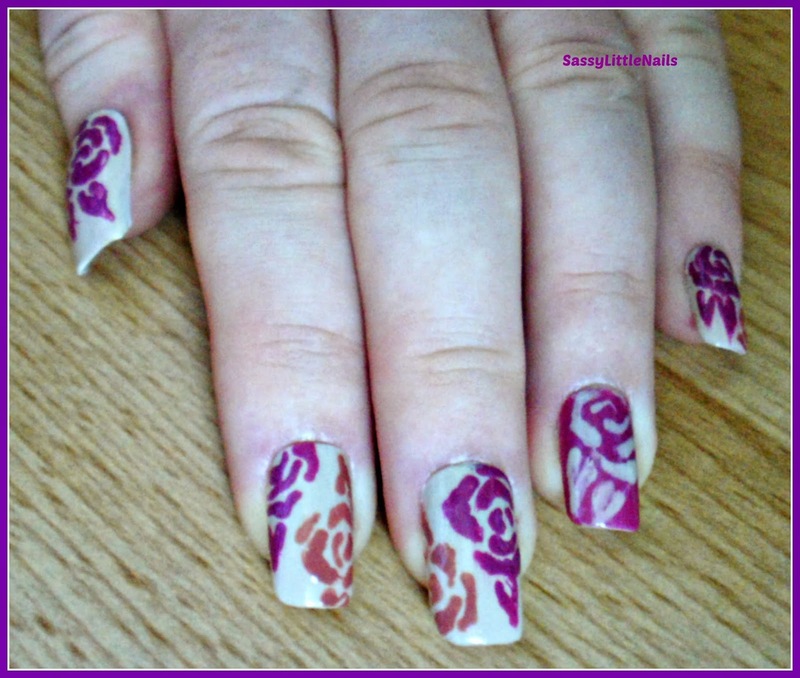 I used the Sinful colors white as a base for the thumb and the middle and little finger. 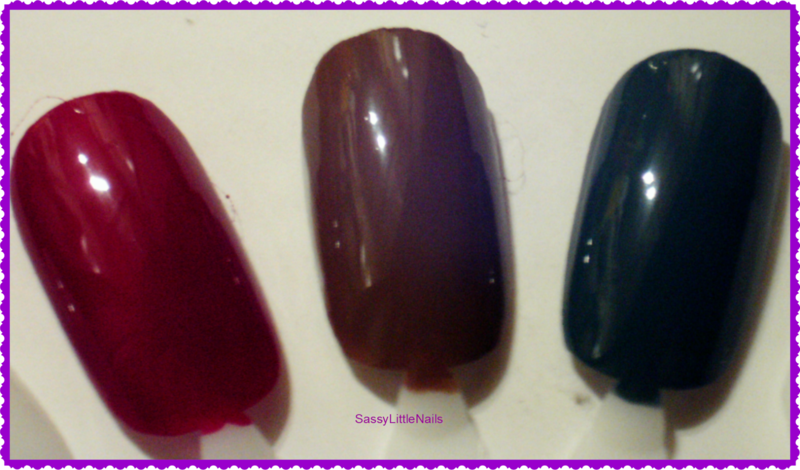 I then used the Red delicious across the first finger and left a small section on the top of the nail for the white polish. 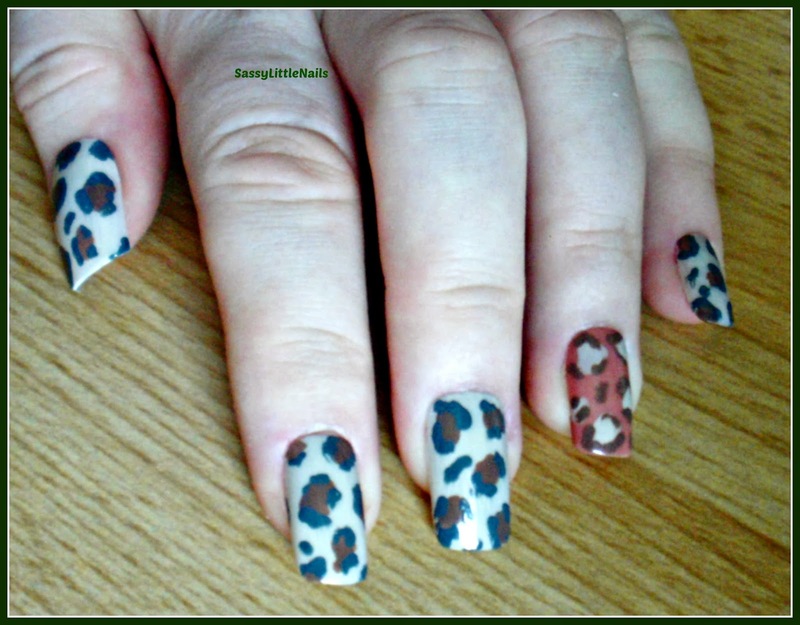 I did the same using the Navy blue polish on the ring finger. 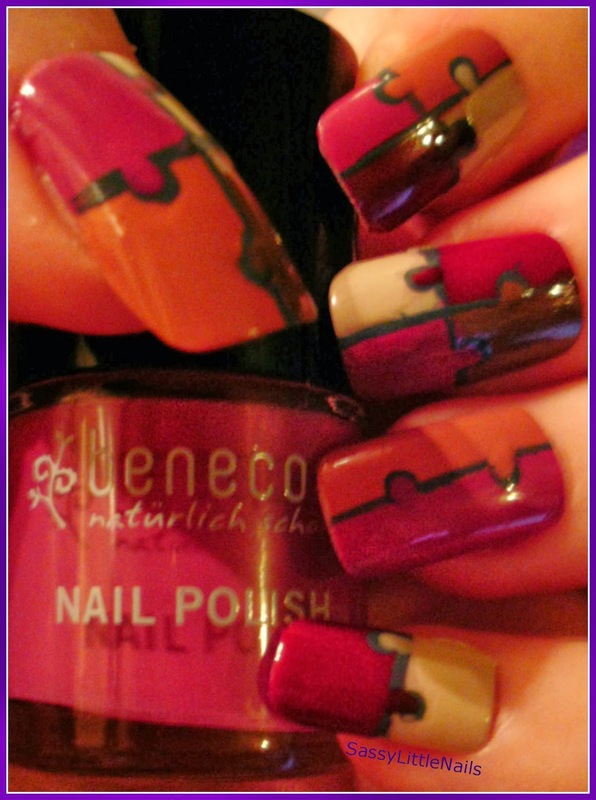 On the thumb I halved the red and blue then left a section on the top to fill in the white with my white nail art pen. I then went back to the middle finger using the Gold pen and made a sun shape and then on the little finger I made a star. 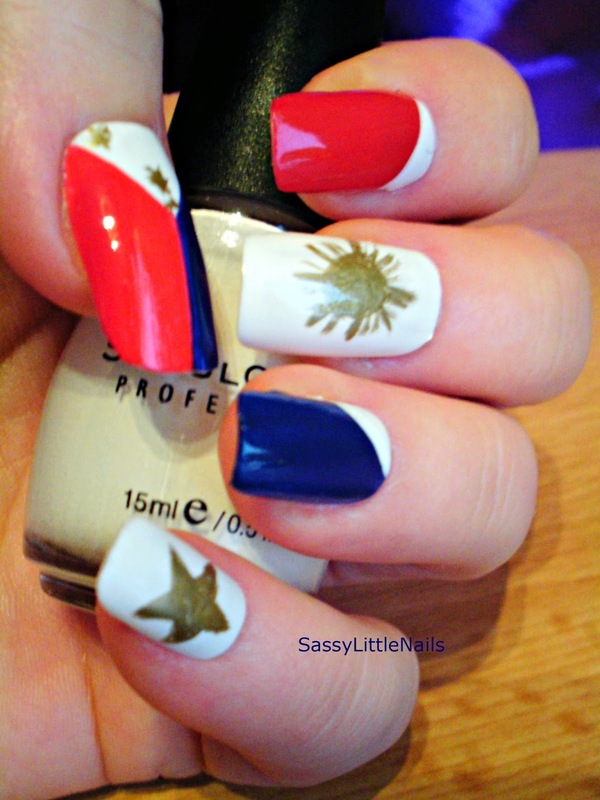 Using the Gold pen I then tried to do the sun and 3 stars on the thumb hehe gave them all a top coat using the Crystal nails 2 in 1 and their all done!